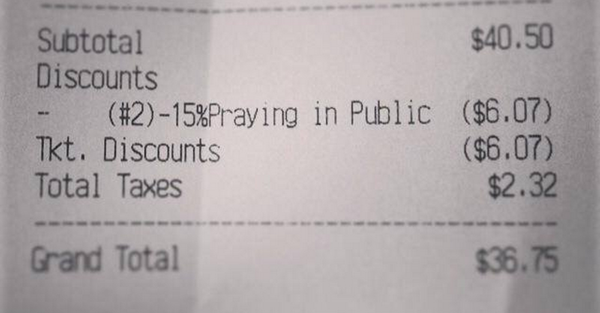 Apparently if you go to Mary’s Gourmet Diner in Winston-Salem, North Carolina and you pray before your meal you get a discount for “public prayer.” Now atheists are suing to stop this private business from indulging this business practice. Of course, like in nearly every case, the atheists have no real legitimate beef. But that doesn’t stop them from using the law as a weapon to destroy religion. The militant atheist group Freedom From Religion sent a letter to the restaurant threatening to sue if they didn’t stop the practice. Sadly, the restaurant was frightened into acquiescing. A North Carolina diner has stopped issuing discounts to customers who pray before devouring their meals. Mary’s Gourmet Diner has been quietly offering the 15% “praying in public” discount for the past four years–but after the story went viral, co-owner Mary Haglund said she feared a lawsuit would come slamming down on her little shop. The owner of the restaurant says that the discount was for anyone who prays before a meal, from any religious affiliation, and she neither asked nor did she care what the prayer was about or from what religious affiliation it originated. But the hate-filled atheists are employing their “lawfare” attacks, anyway. Come on. Is it really the business of these atheists if a restaurant wants to give discounts for prayer? How is that “discriminating” against anyone? If they are still happily serving non-prayers, giving them the same service as people who pray, then there is no “discrimination” happening.